The Catholic Education Service (CES) has appointed a new Pope. It was bound to happen. The CES has long been considered a schismatic branch of the Catholic Church, not paying too much attention to the Deposit of Faith guarded by the reigning Pope, Benedict XVI. The new Pope to be given a position of great authority in the CES is, quite incredibly, though nowadays perhaps not too surprisingly, a retiring Labour MP by the name of Greg Pope, not to be confused with Pope St Gregory I the Great. Neither Pope Benedict XVI, nor Pope St Gregory I the Great would be particularly encouraged by the new Pope recruited by the CES. As Damian Thompson eloquently points out, in May 2008, Greg Pope voted 'No' to a reduction in the limit on abortions to 16 weeks. Why? Well, your guess is as good as mine, but I would imagine that Greg Pope MP is one of those Kungian Catholics who basically don't believe that a human being is a human being when its heart is beating, even audibly, to doctors and interested expectant mothers and fathers, in its mother's womb, at, say, 8 weeks onwards. Meanwhile, the Bishops of England and Wales have released an official statement calling for general repentance for the abuse scandals which have taken place in the United Kingdom. You can read it here. 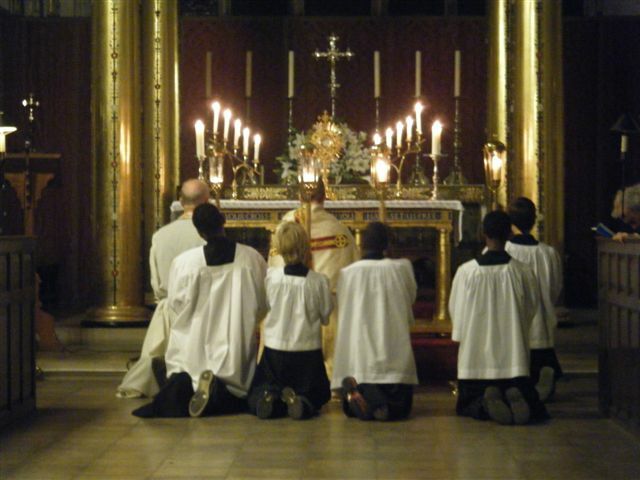 Can anyone remember the last time the Bishops of England and Wales called upon Catholics to place ourselves before the Blessed Sacrament and to pray, to do penance on Fridays and to make reparation for our sins and the sins of the whole World, let alone the Church's clergy? If this is coming from them, in terms of spirituality, then it is heartening indeed. Perhaps the penances done by many in atonement for the lukewarmness of so many Bishops, along with heartfelt supplication that God may make the same Bishops holy, is paying off after all. If not, thank the CDF and the Holy Father, 'whose wise and courageous leadership is so important for the Church at this time' and who issued instructions with words to the same effect, calling for repentance and Exposition of the Blessed Sacrament in order to foster a more loving and reverent appreciation of the Most Holy Sacrament of the Altar among the Faithful. The abuse scandal is often as shocking and as heartbreaking as it is often portrayed even by an anti-Catholic media. However, listening to BBC Radio 4 on the way back from a gardening job today, I began to wonder at the motivations of some of the more prominent campaigners speaking out for the victims. When asked whether they welcomed the latest statement by the Bishops, one campaigner said something to the effect that the Church "which is considerably wealthy (my local parish just about scrapes by and still somehow affords sandwiches for the poor), needs to put its money where its mouth is and sell its assets and buildings in order to help the victims". So, the Church is to help the victims, primarily, financially? This we can only assume, since it must be a financial recompense, rather than a spiritual renewal of the Church about which the campaigner talking. Without wishing to sound crass or uncaring, as far as we know, money does not help mitigate or heal the deep wound of abuse in childhood. Financial compensation - and as far as we can see there has been rather a lot of money handed over to the victims of child abuse by sinful Priests already, even though the entire Catholic Church as an organisation, and a charitable one at that, is not to blame for the sins of those Priests - is a pretty shallow and poor method of helping the victims who are traumatised by abuse. Money won't heal their minds or dare I say it, yes I dare say it, even save their souls. Only Christ can do that. It is the same Christ who has called us to forgive those who have wounded us, and to forgive them from the heart, that said that anyone who offends the 'little ones' would one day prefer to having a millstone tied round his neck and thrown out to sea. If those who speak on behalf of victims of child abuse within the Church are really just concerned with money, rather than actual justice (or, dare I even utter the word, yes I do dare, 'mercy'?) then their calls to see the Church strip Herself of Her assets and buildings (as if Church's aren't closing down enough already) in order to compensate those wounded, betray a vulgar and rather base motivation in their continued media-led campaign for justice. One begins to wonder whether some of the men and women campaigning for justice for those affected by the abuse scandal just want to see the Church Crucified for the sins of a small minority and make a shed load of cash out of the show, like so many prominent rabid atheists and media giants, who appear to wish more and more scandal, shame and misery upon the Church just so that She may, like Her Founder, the Most High Jesus Christ, go through a gruesome and very public Crucifixion. Cough, Richard Dawkins, cough. 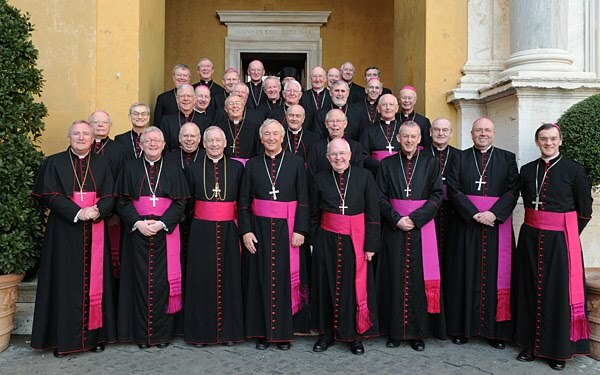 There is no doubt that the Church in the United Kingdom has, because of the abuse scandals in this country, Ireland and beyond, inherited a credibility problem in the eyes of many. The Church, however, even with a set of largely lukewarm and embarrassingly ineffective Bishops and indeed, some scandalous Priests, will still preach the Gospel 'in season and out of season'. We have, after all, a wonderful Pope and some fabulous and holy Priests. The Church will emerge from this, God willing, like one who has been purged, or has benefitted from a serious catharsis. Catharsis, too, is exactly what victims of abuse truly desire. The injury of childhood abuse does not have a monetary value. It is a psychological and spiritual wound. Therefore, the credibility of some campaigners for justice in the aftermath of the abuse scandal would fare better, I suggest, if it didn't become more and more apparant that their desire for justice is grounded in revenge and the love of money. Anyone whose motivations are such as these should have a major credibility problem. We should not be ashamed of our Most Holy Faith, nor of the Catholic Church, nor should we be ashamed to belong to Her and thereby to Christ Who is Her Bridegroom. Those in authority in the Church can lament the past, bewail the sins of Her members and still go on to fight the good fight to the finish for the love of God. But what of the victims? The victims have, due to the sinfulness of some clergy been handed a Cross to bear which is heavy and painful indeed. Yet we should not be ashamed to tell the victims of abuse that their true and abiding home, still, is the Catholic Church. Our Lord Jesus Christ does heal the wounded, the sorrowful, the neglected, the tortured, the anguished and the abused. Our Lord Jesus Christ does this through the Ministry of His Church and has the Power to do this even by merely by being placed on the Altar and adored, for He, Jesus Christ, is Lord and God of all. In the Sacred Heart of Jesus, in the pierced Heart from which pours forth His love, His mercy and His infinite compassion, even the victims of terrible and diabolical abuse within the Church can find the Grace and capacity to forgive. We must not be ashamed to say that. Nor should we be ashamed to say that God can heal and forgive those who are guilty of abuse within and without the Church, for Jesus Christ, Who is Compassion and is Love, is also Lord and God of all. A thoughtful, coherent and well-expressed post. Thank you, Bones. I fear that over the years the multiple (in)actions of the E&W hierarchy have bred in me a kneejerk cynicism towards anything that issues from the EWBC either singly or collectively. A shower is what they are. In sharp contrast to the good and holy, hardworking pps we know who are providing the pastoral fulcrum for an increasingly wised-up laity. How very predictable that McMahon should underwrite the most suitable candidate (of course, we don't know who the others were) for the discredited CES which he oversees. A glance at Mr. Pope's wiki biog reveals him to be a shining product of Catholic education which, naturally, he wishes to perpetuate. It's all very cosy. I, too caught part of that "World at One" interview in the car and was similarly aghast at the mention of the alleged wealth of the Church. It sounded like "Sorry isn't enough: give us your buildings". Obviously I wasn't abused or I would understand how money makes everything o.k.! 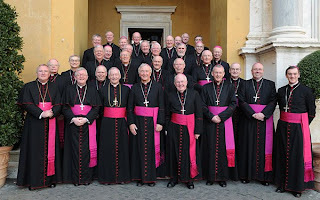 Much of what you say is true but I fear that you, and the bishops, have swallowed the agenda of the seculraists who have used a sins of a tiny group to blacken the church. The bishops should really defend and applaud the vast number of good clergy. No more clergy have abused than police or social workers. Indedd, recent scandals have been perpetrated by female teachers. This apology is a step too far. I shall not go to church in May and listen to this craven drivel. The fanaticism of the "safeguarding commissions" has echoes of the Orkney cases which also had the heady mix of religious people and social workers. Child protection should be in the hands of lawyers: truth and justice whould be paramount which would protect childrn and th wrongly accused. I donj't want anything to do with a church led by these obtuse donkeys! I might come back in June!